You’ve heard of the 12-days of Christmas, a song that gets sung on almost every Christmas album ever released. Whilst this traditional carol reminds us of twelve ordered ways to deal with Christmas, we’ve got 12 steps to help you significantly reduce your financial stresses! Don’t do them all at once… that’s just scary! This easy-to-execute, twelve-step guide gives you one task a month. Execute each of these according to your circumstances and priorities and you will be well on your way to financial freedom. SET FINANCIAL GOALS: Make an appointment to see me, your financial advisor. 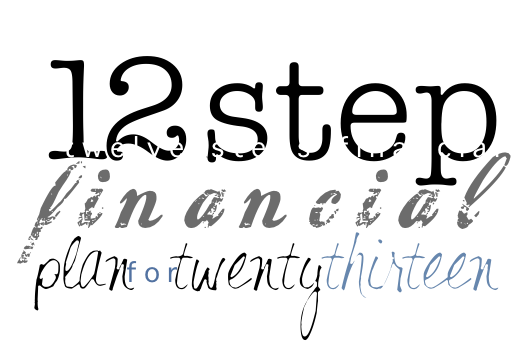 I’ll help you to put your goals for 2013 into writing and review your portfolio. LIFE INSURANCE AND POLICIES: Make sure you’re covered for the loss of a loved one. What would happen to your dependants if you or your spouse were to pass away? INCOME PROTECTION: Protect yourself and your income earning ability. DISABILITY PROVISION: Becoming disabled can be devastating in so many ways. Let me share with you ways to help ease the financial burden in the unforseen event of a disability effecting your income. LONG-TERM SAVING: Pay yourself first… retirement always seems such a long way off, but it is funny how these things creep up on you. SHORT-TERM SAVING: Pennywise… set a goal and save for it! EMERGENCY TOP-UP: Emergency fund, are you saving for a rainy day? STAY ORGANISED: Consolidate all important information, make sure you are able to access any account, policy or emergency fund information without any delay or stress. ENJOY YOUR MONEY: Set some lifestyle goals for the year. Now that you have put your plan in place, it is time for action! In order to keep on top of your finances, try to make this review an annual occurrence. It enables us to change and tailor your portfolio as your lifestyle needs change. Remember that any life changing events, could be a change of job, birth of a child, marriage, divorce etc. will all impact on the efficacy on your financial plan for your future.